We love bright when it comes to things for the boys, and that is why I have always been drawn towards Cosatto. Their baby products have so much personality and so do my boys so they seem a perfect match. 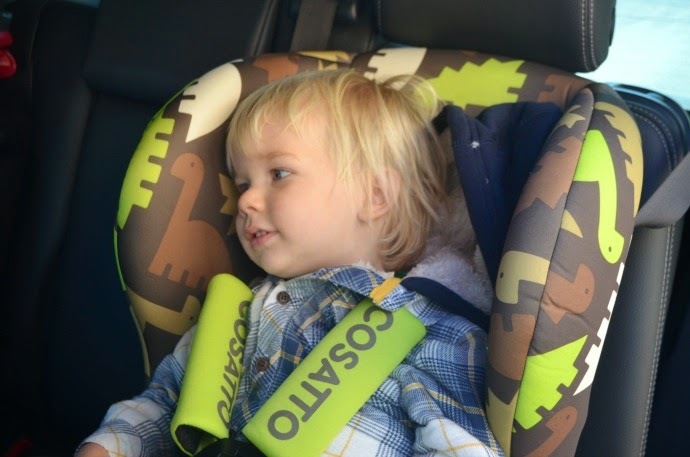 We were recently sent the new Hootle car seat for Archie to try out, a group 0+/1 option that is suitable from newborn all the way through until 18kg (approximately 4 years). Archie is currently borderline for rear/forward facing, but realistically he was too big to rear face as he is quite tall, so we used the seat with him facing forwards. Cosatto say this seat can rear face until 13kg, but baby can be turned at any point from 9kg should you wish. This would have been great for Dylan who reached 9kg long before he was ready to turn, and I wish we had been more aware of the options back then. We loved the design of the chair and with two dinosaur loving boys, the backseat is usually full of roars! The seat is easy to adapt through the stages, and I will be able to use it for the new arrival if I add the newborn insert back in. Reclining the chair is a simple one hand mechanism, and as this seat is designed from newborn upwards, it does have a great recline. 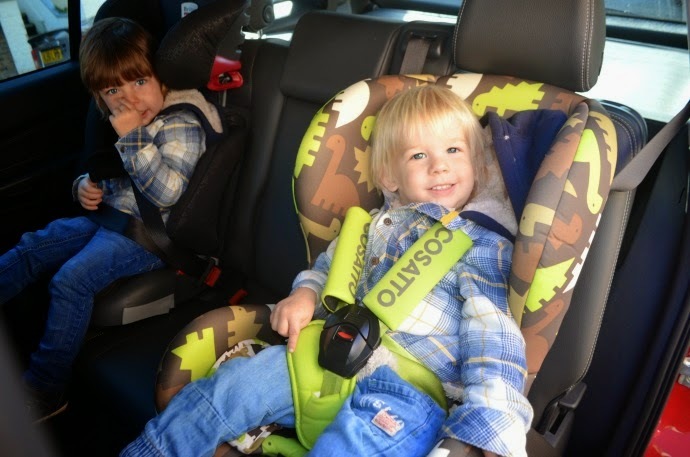 The seat is easy to fit using a standard three point harness whether your child is forward or rear facing, and the harness can be adapted for each child in a matter of seconds. Forward facing, the Hootle feels secure, and Archie has enough growing space. I do imagine that by 4 years he will be quite snug in there (he is currently 21 months), but then again I do have rather large children! I loved that as well as having the instructions in the book, they were also printed on the side of the carseat. 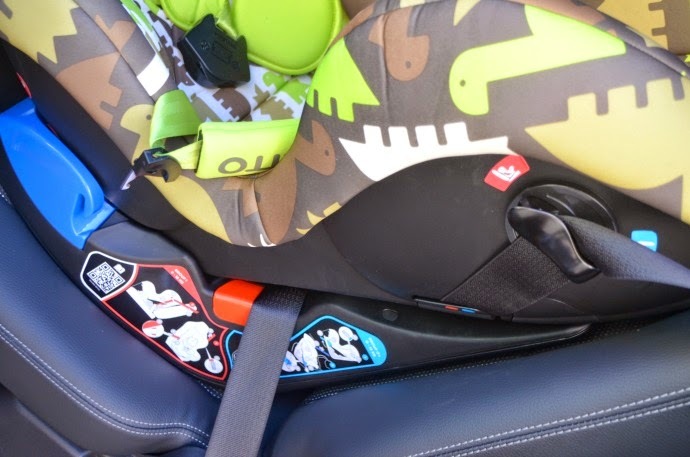 As we tend to use our seats in different cars, it is helpful to have the reminder of how to install them so handy and the fitting system is colour coded depending on which way the child faces. I loved how easy the recline was, and that I could do it one handed. I thought the padding around the harness was great - soft and comprehensive and the buckle was strong enough that neither of the boys could undo it themselves. I did find that the seat didn't feel as secure rear facing when we tried it, but I do think that is because Archie was too big and too strong and wasn't keen to face that way. Forward facing there was no budging it. The seat has great side impact protection and perhaps most importantly, it also has removable covers! My boys seem to be drawn to mess so this is really important for us. 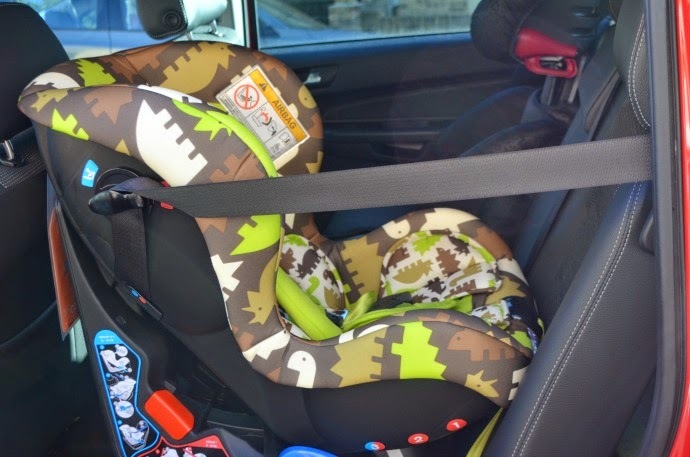 We love the funky designs, bright colours and the comfort of this seat, and having one that is suitable for such a large age range makes it easier for us to swap between children when we use different cars. Check out the Cosatto Hootle on their website - it now comes in their new designs too! We've got Cosatto seats for our girls too because they've been great for fitting such tall little ladies into age appropriate car seats!